For a long time, I’ve been meaning to write a series about places to eat, have fun, and shop in downtown Oakland (I even have a bunch of draft posts written that include stores and restaurants that have long since closed). But since dozens of downtown establishments were vandalized after the Oscar Grant protests, there is a renewed interest by many in downtown Oakland. Yet even with all this interest, there seems to be a lack of knowledge about the DTO. This was evidenced in Michael’s post last week at An Oakland Citizen about Cafe van Kleef. He seemed surprised that van Kleef would be packed on a Friday night. News alert: van Kleef is packed every night. There have been Wendesday nights when I couldn’t find a table there. The DTO is a happening place, and I think it’s time that people realized that. So I’m starting this series to spread a bit of my knowledge about downtown, in hopes that I’ll inspire some people to explore the DTO and that I’ll learn some new things about downtown. Over the next several weeks I’ll post reviews and stories about downtown establishments, in no real particular order. And I’m starting off with Thai restaurants, again, for no particular reason. I hope you enjoy the series. Please let me know if there are particular things you hope I’ll focus on. When DaVan opened up (a year or two ago? ), it quickly became my favorite Thai restaurant in the DTO. The food is mostly very yummy – they make great curries and I love their Pra Ram tofu dish. Their prices are very reasonable – lunches are $6-$7. The main downside is that now that it’s become so popular, the service can be extremely slow. I either call in to order take out or know that lunch is going to take up an hour. The other downside is that they’re not open for dinner. Maybe that will change one day as demand grows? Dazz Thai is only a few months old so I’ve only managed to eat there once, but the food was delicious. I had the Pad See Ew vegetarian – the noodles were cooked perfectly, the flavor was just what I was looking for, and they were very generous with vegetables. My dining companions seemed to enjoy their food as well. Since it’s newer, businesses is slow so it’s easy to find a seat and the service is fairly quick. I’ve yet to try Banyan 14, but the review in the East Bay Express made me feel the need to try it very very soon. 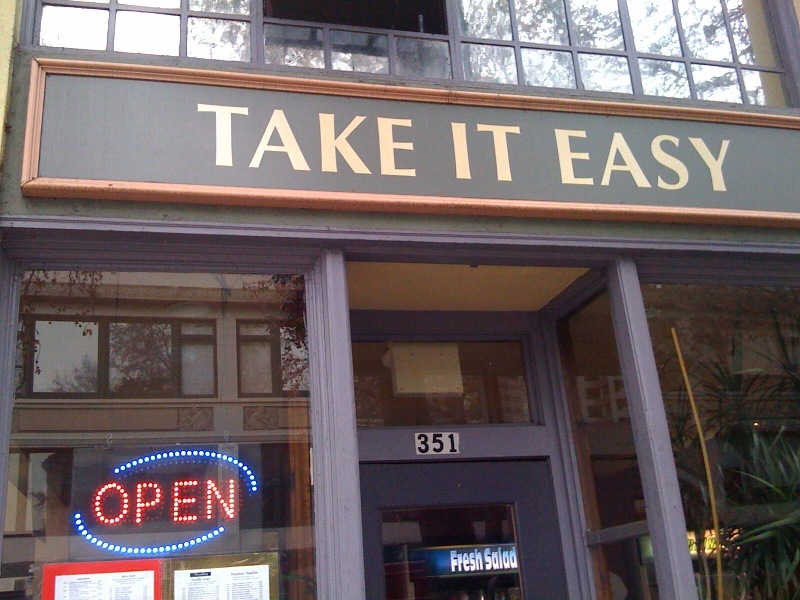 I’m not going to lie – Take It Easy is not my favorite restaurant in the DTO. I used to eat there a lot because it was the only Thai restaurant anywhere near my office, but that’s changed. I hadn’t been there in over a year until yesterday, when I decided to show my support since they were one of the businesses that was vandalized earlier this month. The food isn’t bad – it’s just not anything special. The reasons to go there are that it’s super quick (call in your order and it will be ready in 5 minutes), the staff are very friendly, and they’re open until 9pm. That’s the breadth of my knowledge of Thai food downtown. Let me know if I left anything out. The best Thai food downtown is at Siam Bay – on Clay, between 11th and 12th. It’s next door to Le Cheval, a restaurant I’ve never understood why anyone patronizes. Everything on their menu is delicious, but I usually end up with some sort of green curry and the fish in tamarind sauce. I like to get soup at Take It Easy when I’m sick. 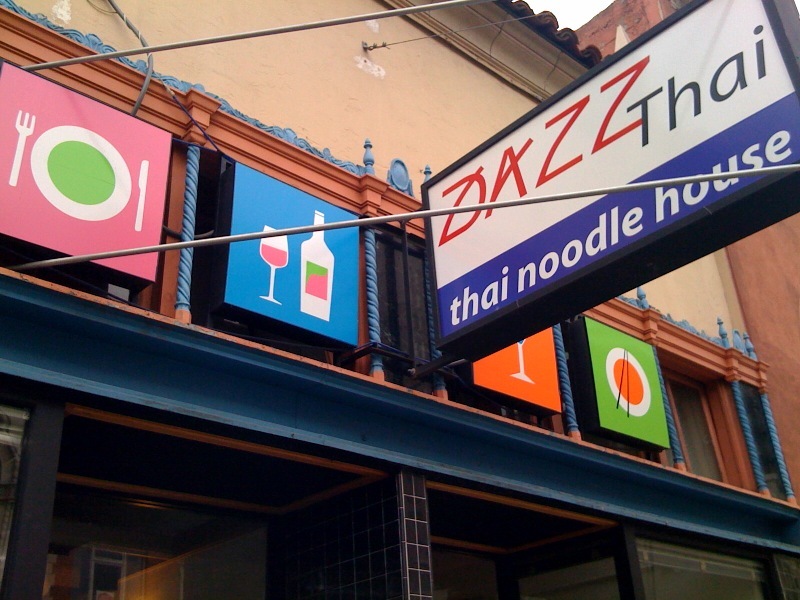 I’ve never been to Dazz Thai. Don’t know that I ever will. It’s just too painful to revisit the spot of my beloved, and now departed, SojuBang. Ah, the old Soju Bang, where teenagers sold alcohol at 4am and allowed smoking. That ended awhile ago, though. Soju Bang seemed to be run by grown-ups in its last few years. The Bang has left the building. Why can’t we have any decent Korean downtown? Dazz Thai is really good though, as is Dava (are they related? Their menus and presentation are really similar). Siam Bay is also good, their fried rice is delicious, and they have a handy lunch buffet for the worker on the go. When I went to Take It Easy a last week to support a vandalized business, I remembered why I never go there. It is quick, though. I love the idea. But it would be really nice if you gave the cross streets for each restaurant. Thanks! Definitely include the cross streets! Otherwise, love the post. And second the Siam Bay – great spot. Next topic: how about a post about vegetarian eats in the DTO. Include Golden Lotus and that place in Old Oak, the name escapes me. By popular demand, I’ve added the cross streets. And Tony, that’s a great idea. I’ll write a veggie post later this week.